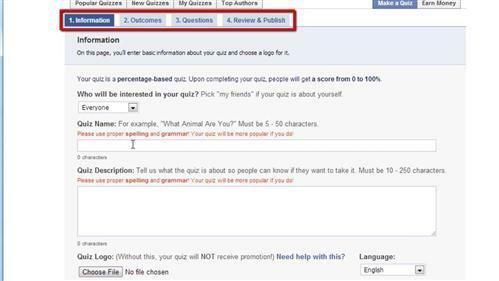 In this tutorial you are going to learn how to post facebook quizzes which can be a great way to entertain your friends. Navigate to Facebook and make sure that you are logged into your account. In the search box at the top of the window search for “quiz maker”. You will see an app called “QuizBone Quiz Maker”, click on this. On the page that loads click on the “Make a Quiz” button and in the new window that appears click on “Go to App” then click “Allow”. Choose the type of quiz you want to make, in this case we are choosing a “Percentage-Based” quiz. You will now need to some information about the quiz. There are four different sections you need to fill out. Once you have done this click on the “Publish Your Quiz” button. A window will appear and click the “Go to Quiz” button. 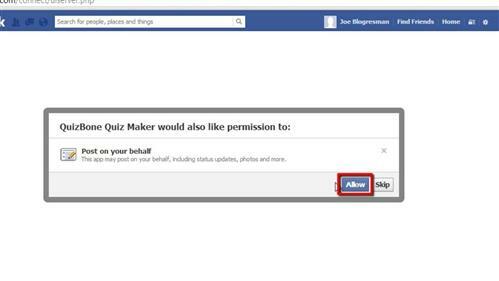 On the new page click “Play Game” then click “Allow”. Now, go back to the homepage and search for “Quizbone Quizzes” and click on the top app that appears. Scroll to the bottom of the page that loads and click the link that reads “Make Your Own Quiz”. Click the “My Quizzes” tab, click on the quiz you just selected and wait for the page to load. 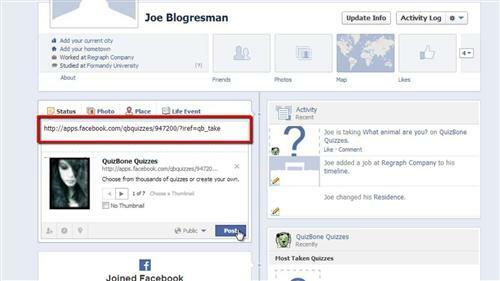 Finally copy the web address of this quiz, navigate to your profile and paste it as a status update. That’s it, you have now learned how to post facebook quizzes.